Coverage: Live on BBC One, BBC iPlayer, BBC Radio 5 live sports extra, BBC Radio Scotland & the BBC Sport website and app. 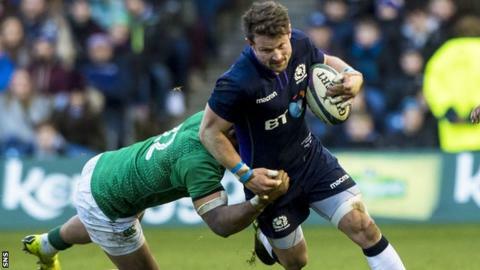 Peter Horne replaces the injured Finn Russell at fly-half as Scotland aim for their first win in France since 1999 in Saturday's Six Nations encounter. Russell sustained concussion on club duty, one of four more players to have joined a lengthy casualty list. Blair Kinghorn starts at full-back with Stuart Hogg also sidelined. Nick Grigg wins his seventh cap at centre in place of injured Huw Jones, while Magnus Bradbury starts at blind-side flanker with Ryan Wilson also out. Bradbury, who will play his first Six Nations match on only his fourth Test start and fifth cap, made a successful, man-of-the-match return from injury for Edinburgh in their victory over Dragons last Friday. "That was above our expectations that he lasted so long but also had big impacts in the first half and the second half," explained head coach Gregor Townsend. "His work in the kick-chase and defence was excellent. He is straight into the team and we are expecting a similar performance from him." As well as the four enforced changes to the starting line-up, there are four further alterations among the replacements. Tight-head prop Zander Fagerson, who made his return from a broken ankle in Glasgow's win over Cardiff Blues, takes over from club-mate D'arcy Rae, with Alex Allan replacing fellow Warriors prop Jamie Bhatti as loose-head cover. Newcastle flanker Gary Graham takes over from Rob Harley, and Glasgow fly-half Adam Hastings and Edinburgh wing Darcy Graham also join the bench with Horne and Kinghorn promoted to the starting XV. Horne, predominantly an inside centre, has won just eight of his 39 caps at fly-half, six of which came as a replacement. While the 29-year-old is a regular in the number 10 jersey for Warriors, scoring 18 points in Saturday's win over the Blues, he has not played there for his country since November 2017. "He has played at 10 for Scotland before and has covered both 10 and 12 and played in the Six Nations in big games, so that was a big factor," said Townsend. "Adam (Hastings) would have been in a better position for selection if he had played more rugby over the last month." Grigg, 26, will start his second Six Nations match - his first coming against Italy in Rome last March - after getting the nod at outside centre ahead of Chris Harris. Townsend said switching Sam Johnson from inside to outside centre was also an "outside option", but "we thought that was too much of a change for someone who has only played two Test matches". The fact Grigg has "played a lot of rugby with Sam Johnson" weighed in his favour, Townsend added. "They played at Stirling County together when they first came over to Scotland and have played a number of times at Glasgow." France have lost 10 of 13 Tests since Jacques Brunel was appointed head coach in December 2017, and are coming off the back of a record Six Nations defeat by England at Twickenham. But Townsend, part of the last Scotland side to win in Paris 20 years ago, is wary of "a very dangerous opponent, combining power, ambition and skill". "Their individual talent is outstanding and, when they get things right - which has predominantly been in the Six Nations at home - they've played with a real collective spirit and fed off the emotion of the crowd," he added. "They will certainly be fired up following their loss at Twickenham." Scotland: Blair Kinghorn (Edinburgh), Tommy Seymour (Glasgow Warriors), Nick Grigg (Glasgow Warriors), Sam Johnson (Glasgow Warriors), Sean Maitland (Saracens), Peter Horne (Glasgow Warriors), Greig Laidlaw (Clermont Auvergne - captain); Allan Dell (Edinburgh), Stuart McInally (Edinburgh - vice-captain), Simon Berghan (Edinburgh), Grant Gilchrist (Edinburgh), Jonny Gray (Glasgow Warriors), Magnus Bradbury (Edinburgh), Jamie Ritchie (Edinburgh), Josh Strauss (Sale Sharks). Replacements: Fraser Brown (Glasgow Warriors), Alex Allan (Glasgow Warriors), Zander Fagerson (Glasgow Warriors), Ben Toolis (Edinburgh), Gary Graham (Newcastle), Ali Price (Glasgow Warriors), Adam Hastings (Glasgow Warriors), Darcy Graham (Edinburgh).